A new national survey by Ottawa-based Abacus Data finds when Canadians are given a list of specific election issues, managing the economy and government trust and ethics lead 12 other issues tested. Over six in ten respondents (65%) said that management of the economy would be very important to deciding who they would vote for while 60% said that government ethics and trust would be very important. Other important issues identified by at least four in ten Canadians included protecting the environment (39%), dealing with poverty among seniors (47%), keeping taxes low (46%), protecting pensions (46%), and Canada’s reputation in the world. Respondents were shown a list of 14 issues and asked to select as many or as few that they consider very important to helping them decide how to vote. After being asked which issues were important, respondents who selected an issue where asked which federal party, if any, is best at dealing with the issue. It is on this question that we see clear areas of strength for the three major parties. 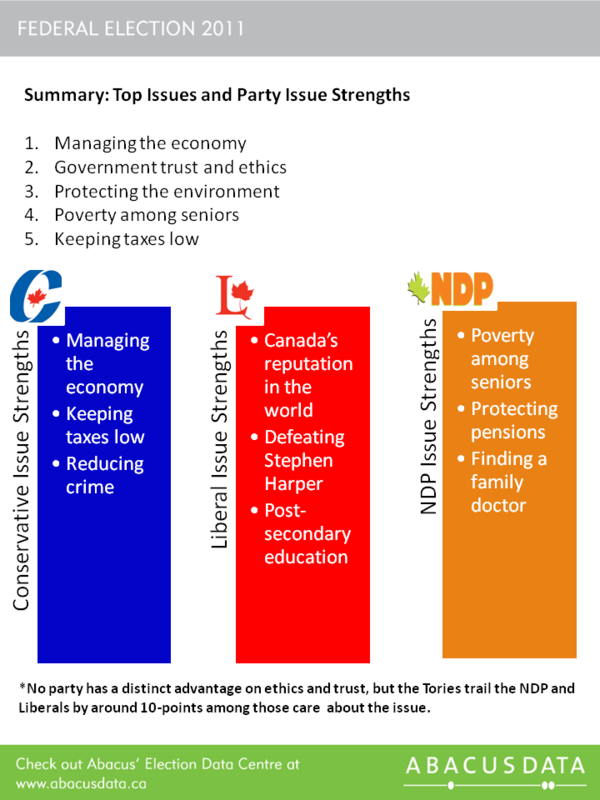 The NDP leads on its core policy areas: poverty among seniors, protecting pensions, and finding a family doctor. The survey also found that no party has a distinct advantage on ethics and trust. However, the Tories trail the NDP and Liberals by around 10 percentage points among people who care about the issue.